During the next five years, Africa is expected to be home to seven of the world’s 10 fastest-growing economies. Work published in the Harvard Business Review estimates that at current growth rates, African consumers will purchase $1.4 trillion in goods and services in 2020. That’s right in line with spending projections in India — and in excess of projections in Russia. Unfortunately, this growth hasn't proportionately benefited women. Even though women make up more than 50 percent of Africa’s population, they’re seriously underrepresented in the workforce and are only just beginning to emerge as a serious consumer bloc. 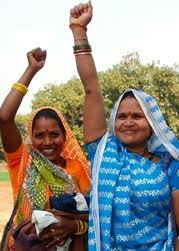 Women are the backbone of developing communities. This is certainly the case in Africa. Statistics show that the average man reinvests about 30 percent to 40 percent of his income into his family, whereas the average women reinvests 90 percent. Smart, targeted support for key social institutions, plus scalable private-public partnerships that empower women and girls, will help ensure that Africa continues its path toward prosperity. Investing in women entrepreneurs is a critical step in that path. Successfully starting a business helps women become self-sufficient, and provides more flexibility for their families. The Global Entrepreneurship Monitor reports that in two African countries, Ghana and Nigeria, women start businesses at a greater rate than men. Those models can and should be replicated across the continent. One of the best ways to increase female entrepreneurship is to improve access to credit. Most women just need a small amount of start-up capital to execute their business ideas. Already, international financiers are catching on to the fact that supporting developing world entrepreneurs is a smart investment. The Development Credit Authority, the venture wing of the United States Agency for International Development (USAID), has turned $82 million in investment in 64 developing countries into $2.3 billion over recent years. In order to reach their full potential, women in Africa also need access to improved health services. Every two minutes, a woman dies from childbirth — and 99 percent of those deaths are in developing countries. Right now, in a century of miraculous technological advancement and global prosperity, the average girl in Chad is still more likely to die in childbirth than attend secondary school. And among those women who survive, two out of every 10 suffers a complication, like fistula, that permanently hampers their work productivity. Across the developing world, and particularly in sub-Saharan Africa, cervical and breast cancers are leading causes of cancer deaths among women. Roughly 85 percent of all women diagnosed with cervical cancer every year live in low-income countries — and more than half of those diagnosed with the disease will die from it. There are innovative public-private partnerships designed to effectively combat female cancers in Africa. The George W. Bush Institute leads an initiative called Pink Ribbon Red Ribbon, which takes a community-centric, results-oriented approach to expanding access to cervical and breast cancer treatments in the developing world. Over the last few years, Pink Ribbon Red Ribbon partners have supported 41,100 pre-cancer screenings and more than 100,000 HPV vaccinations throughout Africa.Kings Communications.